Providing the $1,000 TS82 Scholarship to a graduating senior is our way of giving back to a community which has supported us throughout our loss and reward a student deserving of such an award for his or her hard work in school, in the sport they love and in our community. TS82 Scholarship applications are available at the school counseling office. Contact Kristen Portaro at Kristen@tylersway.com for more info. The recipients stand out as leaders in their class both in the school and on their respective teams. They are students driven to make a difference in their lives, the lives of others and in their community. These amazing young adults are a positive role model to their peers and inspire those around them. 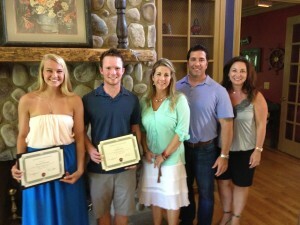 The TS82 Scholarship recipients are presented here. William Webster is a well rounded leader who understands the importance of building positive relationships and setting a good example for those he works along side. Those around him will tell you that they don’t get much nice and better than William. He played lacrosse for Northview all four years and was a standout player on the tem. He is a committed Boy scout who has participated in several projects over the years in our community. He is an Eagle Scout and his project was building an artificial turf practice area next to the stadium for the lacrosse players. The list of other community services he participated in continues on through his church, coaching flag football and much more. His commitment to his academics is obvious through his grades and his role as Class Council Treasurer in years past. He was recently voted by his peers as “Friendliest” and “Best to Take Home to Mom”. Shane Burke played basketball, football and varsity soccer all four years of high school. He is a leader both on and off the field and his love for community is obvious through his work. In sixth grade he started an organization called Athletes that Cure. Their original goal was to raise $10,000 by their graduating year but over the years as captain of this group, he has helped raise over $50,000 for groups such as the Special Olympics, Children’s Hospice and St. Judes Children’s Hospital. The list of other community services he has helped with continues on to feeding the homeless and organizing a shoe drive that collected fourteen hundred pairs of shoes for the needy. 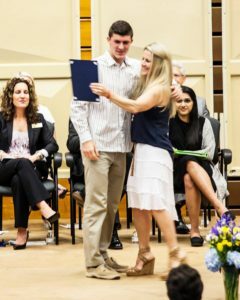 In high school, he has been captain of the varsity soccer team all four years and was awarded the Positive Athlete Georgia Award and the NCSA Athleadership Award for his integrity, dedication and sportsmanship. He will be attending the University of South Carolina in the fall. 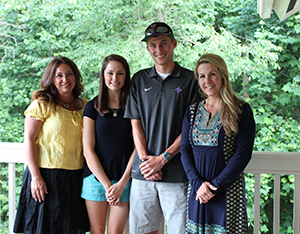 This years 3 recipients were chosen to receive the TS82 Scholarship awards. Darius Chinoy was a student athlete who stayed very active in both his school and community. Outside of school he volunteered at his church and completed his Eagle Scout Project. He also created and carried out a nationally recognized service project called X Ur Text that was to help stop texting and driving. He was a representative of Class Council and captain of his track team for three years. In the words of his school counselor, “ Darius is the student who can do everything, but always in the most humble way.” Darius will be attending Georgia Tech in the fall. Berkley Bryan proved to be a leader in her school and for her community. In 9th grade she was selected as one of fourteen youths across the state of Georgia to serve as a representative of the Special Olympics Youth Leadership Team. She continued to give her time and positive influence to this program throughout her fours years of high school. She is a founding member of the Jr. Civetan Club and served as Co-President and President her junior and senior years. As an athlete, she was a member of the track and field team in high school. Berkley will be attending Samford University in the fall. Carly Rudnick was a varsity lacrosse player who also mentored middle school girls through the Cougar Mentoring Program. She has been an active member of the school and her community. Her senior year she was Vice President of Class Council and helped with year book design. She will be attending the University of Georgia in the fall. The Tyler Safarriyeah Foundation awarded TS82 Scholarship Certificates to two very special young adults. Jay Reynolds proved to be a leader in school, for his community and for his team. 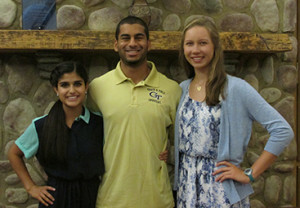 He excels in tennis but what impressed us the most was his involvement in Chattahoochee’s No Place For Hate Club. He has helped start and run this club which we feel is a positive contribution for the youth in our community by bringing awareness to preventing and ending bullying and cyber-bullying. Jay is involved in many other activities at school and seemed to understand that loving life, laughing often and playing hard all go hand in hand in being a well balanced teen. 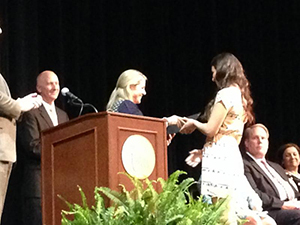 Hannah Edwards used her time and talents to give back while playing varsity soccer and achieving a 3.75 GPA. She started the Mission for Maddie Foundation to raise funds for a friend who lost her mother to cancer. In 2012 Hannah went on a mission trip to the Dominican Republic to share her love of soccer and God. She has participated in various community activities including the Will to Live races and the Polar Plunge for Special Olympics as well as volunteering at her church. Hannah believes that nothing great in life can be accomplished unless your heart is 100% in it. Her soccer coach says that everything she attempts is with such strong desire to succeed that she lifts others around her in the process.